Decoder to control signals on the model railway. The decoder uses LocoNet for communication. The decoder works with Swedish signal aspects and manages 10 signals with up to 7 lights in each (a total max of 64 lights). Switching the light on and of simulates the smooth transitions of the real signal. Blink interval, intensity of lights etc. is configurable in the decoder. Signals can be controlled externally from a computer or panel, and/or work fully automatic based on occupied tracks, state of switches and the state of other signals. Uses LocoNet and work together with other units that supports LocoNet. 16 connections that can be used by occupancy detectors. Direction dependent track status can be defined. This means a "sensor" that reports a train on the track coming only from a given direction. Needs a power supply of 5 Volt, not included. Power supply can be of type "mobile phone charger" and connects through an "USB micro"connection or through a "screw terminal". 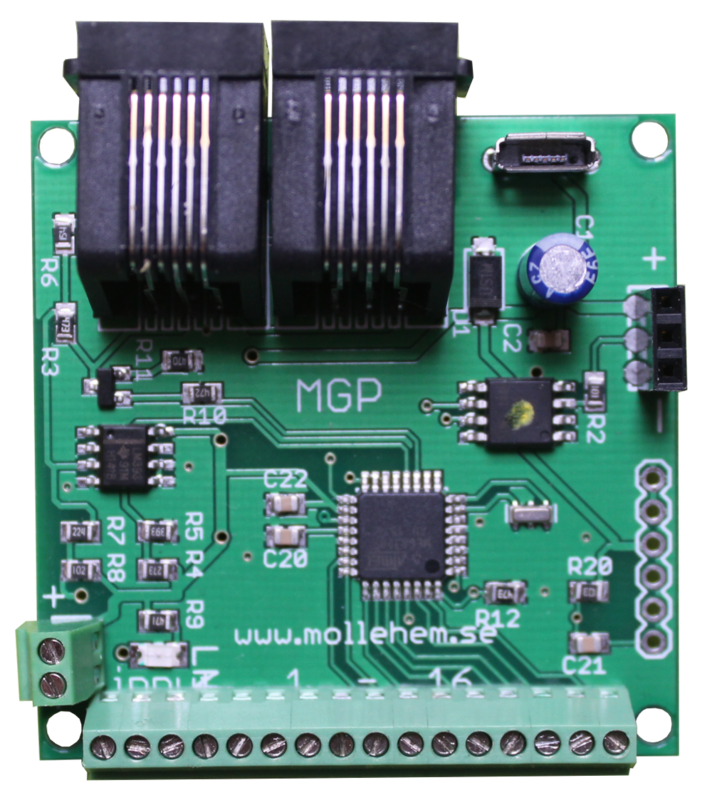 Card can be connected together through the screw terminal" and use the same 5volt power supply. Intended for signals using LED lights. The signals connected through LED driver boards type LED3 and/or LED12. Link to the instruction manual Instruction Signal decoder. Note - the decoder supports Swedish signals. Variants supporting German, and one supporting Danish, signals is in development. Beta-testers are needed! If there is interest in other variants, please take contact.